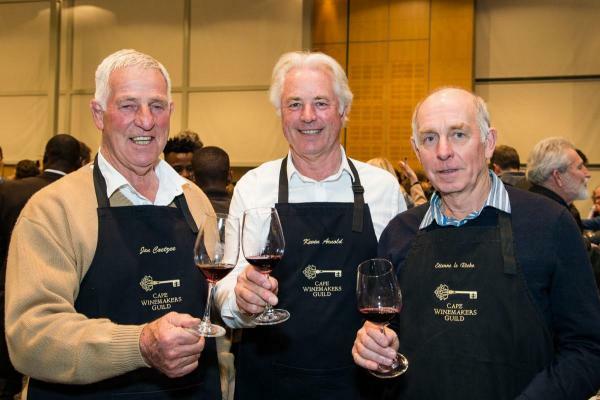 The 34th Nedbank Cape Winemakers Guild Auction to be held at Spier in Stellenbosch on Saturday, 29 September 2018 marks the final hurrah for three founder members of the Guild. Up for their last curtain call, Etienne le Riche, Jan Boland Coetzee and Kevin Arnold will be participating in the auction for the last time. This annual South African wine industry showcase presents a meticulously curated collection of rare, individually crafted wines of great diversity made exclusively for the auction by members of the Cape Winemakers Guild. Innovative winemaking, craftsmanship and consistency of quality is the hallmark of the auction that is open to the public and enjoys a loyal following of wine buyers and private collectors. Over the past 34 years, Le Riche, Coetzee and Arnold have been part of the auction’s growth in stature from a niche event to the archetype of South African winemaking prowess. The Guild was formed in 1982 by a handful of young winemakers with the goal of sharing their resources and knowledge that would not only improve the quality of their own wines, but more importantly raise the bar for the industry as a whole. The first auction was held in 1985. ‘For me personally the auction has always been a binding attempt to make a difference as a group, to give exposure to winemakers who work in isolation and to get international recognition for the quality of South African wines and our country’s winemakers. The rigorous selection process for the auction has also served as a driver to create exceptional wines. I will always cherish the camaraderie that the Guild has offered,’ says Le Riche, who still looks forward to being part of the Guild as a non-producing member. Each of these respected legends has a wine that will go under the hammer at this year’s auction in Stellenbosch. Wine connoisseurs will be able to bid on Etienne le Riche Cabernet Sauvignon Auction Reserve 2015, made from a single vineyard from the Helderberg area. Jan Boland Coetzee’s Vriesenhof Vineyards Swanesang Pinot Noir 2015 will be auctioned in 1,5 litre magnum bottles packaged in beautiful wooden boxes. Kevin Arnold’s last auction wine is Waterford Estate ‘1988 Kept Aside’ Chardonnay 2017, a wine of great lineage that underwent natural fermentation in the barrel. These three wines form part of the fine-tuned 2018 auction line-up of 48 uniquely crafted wines comprising 31 reds, 14 whites, two Méthode Cap Classique (MCC) wines and one port-style wine. The 34th Nedbank Cape Winemakers Guild Auction, conducted by Henré Hablutzel of Hofmeyr Mills Auctioneers for the 21st consecutive year, is open to the public and will be held at the Spier Conference Centre in the Stellenbosch Winelands on Saturday, 29 September 2018. Registration for the auction and VIP lounge will close on Wednesday, 19 September. Telephonic and proxy bidding options are available to those who are unable to attend in person. To find out more, visit: www.capewinemakersguild.com, email info@capewinemakersguild.com or call Tel: +27 (0)21 852 0408.